Design and purchase your custom wrought iron return rod with just a few clicks. 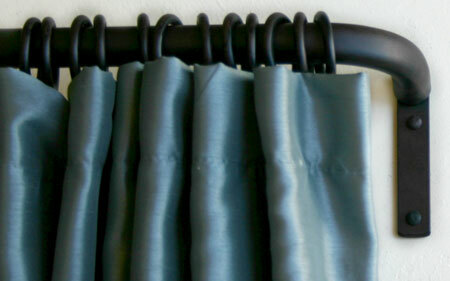 It's easy, design the perfect iron curtain rod from the many choices below and click add to cart. We will address your special instructions prior to processing your order. Here is a link to our measuring guide for return rods. Our 7/8" diameter return rods (French rods) are hand forged to your specifcations with a graceful 90 degree return at each end. The sturdy 7/8" diameter spans more distance and carries more weight, allowing you to install them without all those extra mounting brackets being in the way of your curtain draw. the projection on these rods is 3.5" to rod center. Longer projections are available. If you are looking for 1/2" solid iron return rods (French Rods), see our Cafe Rod page, and select outside mount.